How Much is a NY Speeding Ticket? 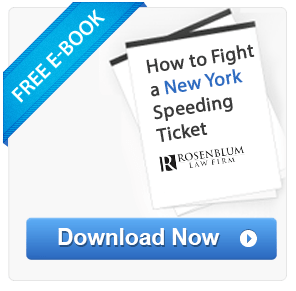 If you received a New York speeding ticket, you are now facing points, fines and surcharges, potential DMV penalties, and also increased auto insurance. A speeding ticket in New York State costs between $45 and $600. For speeding 1 to 10 mph over the limit the rage is between $45 and $150. For speeding 11 mph to 30 mph, the range is $90 to $300. Finally, for speeding 31 mph or more, the range is $180 to $600. Every New York speeding ticket carries a court fine, mandatory New York State surcharge and points on your driving record. If you are a repeat offender, the range of fines is significantly higher. The fines listed are for speeding tickets received anywhere in New York State except for the five boroughs (Manhattan, Brooklyn, Bronx, Queens and Staten Island). Driver Responsibility Assessment Fee (DRA): If you receive 6 or more points as a result of violations that occurred within an 18 month period you will be subject to an additional fine known as the Driver Responsibility Assessment fee (DRA). When you reach 6 points you will be penalized $300. An additional $75 will be imposed for each point after the 6-point mark. This penalty is paid to DMV and is separate and in addition to the court fines associated with your ticket. At 11 points the NY DMV will suspend your NY license or NY driving privileges (if you live out of state). Any points accumulated for violations which occur within a given 18-month period count towards suspension. If you have a CDL license or a Junior license, the penalties can be even more severe. The Rosenblum Law Firm is the largest and highest customer-rated traffic violations law firm in NY. With an overall success rate of well over 90%, our firm has helped thousands of clients get excellent results. How Much Will My Auto Insurance Increase for a Speeding Ticket? Simply put, auto insurance is all about risk. You pay an auto insurance premium so that if you get into an auto accident your insurance provider will pay for the damage. An insurance underwriter’s primary role is to determine what your premium should be based on how likely they believe you are to get into an auto accident. The more traffic violations you have on your record, the greater the risk and the higher the premium. If you accumulate enough traffic tickets, your insurance company could even cancel your policy. Studies by sites such as InsuranceQuotes.com have concluded that your NY auto insurance premium can go up as much as 22% for a single speeding ticket. Should I Fight My Speeding Ticket or Plead Guilty and Pay the Fine? In most cases, it is NOT a good idea to plead guilty to the charge. Police officers and prosecutors want you to plead guilty to speeding charges because it makes their job easy. Pleading guilty means you give up your rights to a trial and you automatically have to pay fines, incur points on your license and pay higher auto insurance premiums. Instead of facing these consequences you can choose to plead not guilty and fight your ticket! Will a New York Speeding Ticket Affect Me if I Live in a Different State? A specific strategy for your case and tailor it to the court where your speeding ticket is being handled. A low flat rate to take care of your case; you will not pay more than the price you are quoted during the consult. We offer representation by a licensed professional attorney to give you advice and defend you by negotiating on your behalf (if applicable) and/or taking your case to trial. In most cases, you do not have to spend a day (or more) in court. You won’t have to waste time and money driving to court and waiting around for hours for your case to be heard. We have a 97% success rate in reducing traffic tickets in NYS (where applicable). We are the largest and highest rated traffic violations law firm in New York State. Hiring us is fast and simple. Call us at 888-434-0406 for a free consultation. How a New York speeding ticket is typically handled depends on the jurisdiction (where you received the violation). Since the process of fighting a speeding ticket can be more complex than meets the eye, we strongly recommend that you hire an experienced lawyer to handle your case. Call us at 1-888-434-0406 for a free consult. If you received a speeding ticket in any location other than NYC, your ticket will be handled by a city, town or village court. The name and address of that court is listed at the bottom of the ticket (see example here). 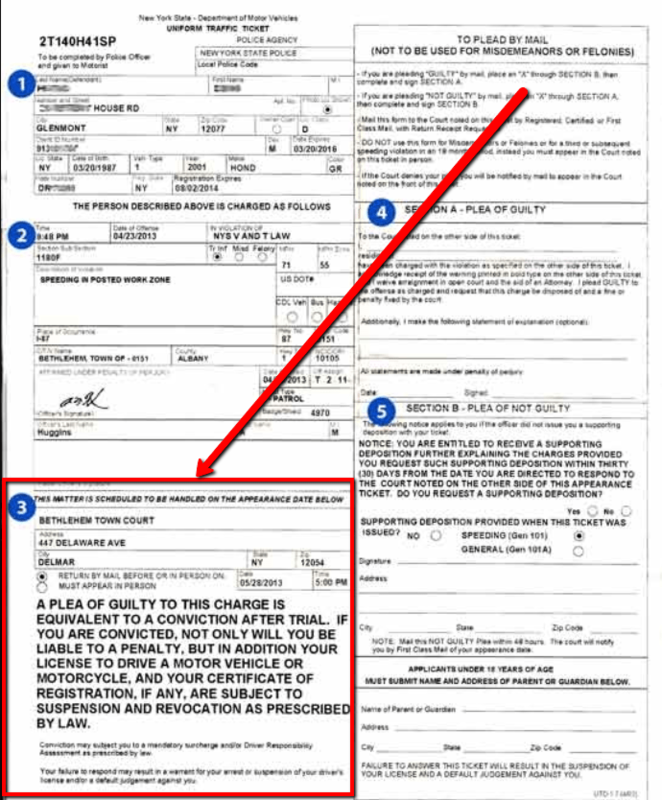 If you want to fight your ticket, you have to enter a plea of “Not Guilty” by filling out that portion of the ticket and mailing it to the court. The court will mail you a pre-trial conference notice on which to appear and discuss your case with the prosecutor to see if you can agree on a settlement. Note, a prosecutor is not required to offer you a deal and may offer you a less favorable deal if you are not represented by an attorney. Remember, attorneys (like the prosecutor) are skilled negotiators. You also have the right to reject any settlement you are offered and have a trial. The trial will most likely be held on a second or third court date (this means you will have to appear in court more than once). At the trial the police officer will present testimony to support his case. You have the right to question or “cross-examine” the officer. The judge will make a ruling of innocence or guilt. If you are found “not guilty” you will not be required to pay any fines and you won’t get points. If you are found guilty you will get the full amount of points and be required to pay a fine. In New York City the tribunal handling your ticket is called the Traffic Violations Bureau or “TVB” (except in a criminal case like DWI or reckless driving – those are handled by the criminal court). In the TVB there are no settlements or plea bargains so if you want to fight your ticket, the only way to do so is to have a trial. Trials are tricky business and best handled by an experienced attorney who knows how to ask the right questions and make the best legal arguments in your favor. Call us at 1-888-434-0406 to find out how we can help you fight your NYC speeding ticket. Can You Go To Jail For A Speeding Ticket In NY? I got a $163 fine for broken tail light, I think that’s a bit much for a taillight. I pled guilty cuz I had missed my court date a few months ago. If I had known it was going to be that much I would have pled not guilty. Is there some way to fight this even though I already pled guilty? Hello Erika and thank you for your question. While it is possible to file a motion to withdraw a guilty plea, it is not something we would recommend in this situation as the costs will almost certainly outweigh the benefits here. I received a speeding ticket today in Canandaigua, NY (Ontario County) for going 45mph in a 30mph area. I felt that I was going with the flow of traffic around me and made a stop at a red light 4 way intersection when the officer pulled up behind me. I continued to drive after stopping at the light at the 30mph and the officer pulled me over a minute after continuing to drive and claimed that I was driving at 45mph before the red light. What are the points and fine cost for a ticket like this? Hello Jason and thank you for your question, for this particular ticket, you are facing 4 points with a total fine of $393. Please feel free to contact us at 888-883-5529 for a free consultation about your case. I received a speeding ticket in queens going 72 on a 50 mph zone. I got the ticket in 2016 I adjourned the first appearance to November 2017 when I went the officer was on vacation so they again adjourned it to feb 2019 I completely forget the date and yesterday I received a letter stating I am now in default and if I do nothing they will suspend my license. Can I cantinus fighting this? Can your firm help me? Do I even have a chance ? Thank you for your help. Hello Melissa and thank you for your question. Due to the complexity of your case, I strongly advise you to call our law firm at 888-883-5529 for a free consultation about your case. I was ticketed for going 100 on a 65 zone outside Buffalo. I had a rental car and was driving on a Polish driving license. What are the fines for something like that? Are there any chances for reduction? The officer actually recommended that I plea not guilty. Hello Tom and thank you for your question. This 8 point ticket has a fine of $693, along with a $450 assessment fee. In order to provide further information, please provide us with the specific name of the court that has issued you the ticket. Ticketed for 80 in a 55 while performing a passing maneuver as soon as I saw a decent opening to get around a driver in a white car moving too slowly in the left lane while they were passing/paralleling what I think was a personal work truck configured with utility tool boxes, while on my way to work for a non scheduled call in. I work as a building repairman at a nursing home, weekend calls are usually urgent as was this one involving a malfunctioning gas operated appliance. No one in front of the slower driver in the left lane or in the right lane in front of the utility truck, the left lane driver took far longer to pass the utility truck than would be reasonable. The police officer was in motion in the opposite direction (ticket shows “Radar”)while I was gaining speed only to perform the passing maneuver after the white car finally managed to create enough distance for me to move to the right to get past them. I won’t deny in that instance I was speeding but the ticket weirdly gives me the option to explain my actions if I check the guilty plea box. Do I just check the guilty box, give no explanation, and accept what they determine as the fine, or would it be worth my time explaining the whole issue? Hello Jennifer, in order to provide you with specific information regarding this ticket, I would need the name of the court that has jurisdiction over your case. There are two court systems in NY – both having differing procedures. Received a speeding ticket going 75 in a 55. Officer was in a moving vehicle going the same direction and “verified” my speed by radar. How much is the speeding ticket? How much will it be to retain your services? Before providing you with any specific information regarding this 4 point ticket, please provide us with the location of the incident, as fines vary between the jurisdictions. I just received a speeding ticket on the way back from Canada in Tonawanda for going 75 in a 55. What is an estimate of what the charge would be? I am in Buffalo for work from California and will be going back home on the 13th. Would be great to not have to come back here to go to court. Fadi – this 4 point speeding ticket will result in a fine of $393, along with a significant impact on your insurance rates. Retaining an attorney will allow you to contest this ticket without personally appearing in court. I received a speeding ticket on the Thruway (83 in a 65) and I am just shy of my 19th birthday. What will be the fine and increase in my insurance (and points). Lisa – You are facing a 4 point ticket with a fine of $393, along with a significant increase to your insurance rates. I therefore suggest contesting this violation to mitigate these consequences. Hi there, I was pulled over for doing 90 in a 65 and since I had a PA drivers license and not a NY drivers license I was also cited for being unlicensed. This took place in the town of Chazy, NY. I don’t have insurance as I don’t regularly drive – how much would this cost? The fine for this 6 point ticket is $393, along with a $300 assessment fee. I was driving 81 in a 55 zone (nsp). I had got a speeding ticket around 2 years back for speeding. I pleaded guilty and got 4 point last time but i do not want any more point. What should I do. My traffic court is Suffolk County Traffic and Parking Violations Agency. I would suggest contesting this 6 point speeding ticket as there will be significant consequences including fines of $393, assessment fees of $300, and a substantial increase to your insurance rates. I recently made a trip to USA (I’m from Quebec, Canada) and on my way back I was stopped by a police officer and have received a ticket for 81mph in a 65mph zone. The ticket was issued in the Town of Chester, NY. What implication will this have on my Quebec licence, how much could this cost and what should I do? Phil – this ticket will result in a 4 point speeding ticket in NY (3 demerit points will transfer to QC). This ticket may also have a significant impact on your insurance rates, and will have fines of approximately $393. I therefore suggest contesting this ticket to avoid / mitigage these consequences. I recently made a trip to USA (I’m from Ontario, Canada) and on my way back I was stopped by a police officer and have received a ticket for 80mph in a 55mph zone. The ticket was issued in the Town of Carrollton, NY. What implication will this have on my Ontario licence, how much could this cost and what should I do? 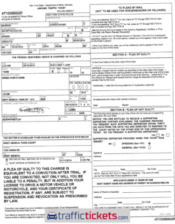 Min – You are currently facing a 6 point ticket in NY, that will result in total penalties & assessment fees of $693. Ontario will assess 4 demerit points for this violation. I therefore suggest contesting this violation to avoid the fines, points, and insurance implications. i was caught doing 75 in a 55 at 10pm with very few other cars on the road. Ive had a clean UK licence for 18 years a clean NY State licence for 1 year. When the officer asked me why she pulled me over, i answered, ‘going too fast?’ Can i still plea not guilty and appear in court with the hope of reducing any fee/points? or should i just pay the fine? James – In order to provide further information, please provide us with the name of the court that has jurisdiction over your case. I got a 1180D speeding ticket for driving 82 at 65 in Steuben County NY. I’m holding a NY license. I was following other cars in front of me and didn’t think I was that fast. It was my first ticket. I won’t be able to show up on the court day because I have school 5hrs away from the court that day. What would you suggest me to do in this situation? Doni – I suggest contesting this 4 point ticket as it will result in both fines, and insurance increases. Hiring an attorney will allow you to contest this ticket without the need of a personal appearance. i was 84 in a 65 zone, i have a probationary licence from NJ, what i am looking at?? Urvashi – you are looking at a 4 point speeding ticket, that will add 2 points onto your NJ drivers license. As this may have serious implications, I suggest contacting us for a free consultation at 888-883-5529. I recently made my very first trip to USA and have received a ticket for 70mph in a 55mph zone. Not trying to make excuses but I thought for sure the speed limit was 65mph…and I was wrong. Needless to say your bill collectors (highway troopers) are not very polite or forgiving. Even after I admitted to doing 75 as I thought 10 over I got the ticket. What should I do and how much could this cost? Derek – You are currently facing a 4 point speeding ticket that will transfer 3 demerit points to ON / QC. The fine for such a violation is approximately $393, along with a substantial increase to your insurance rates. Please clarify the location of the court in order that we may provide you with more specific information. I got ticket for 75 mph in 65 mph zone, I’m from Texas and want to know possibilities I heard about passing come course. In order to provide further information, please advise me of the name of the court that has jurisdiction over your case. I got a ticket for 87 mph on the highway in a 65 zone. While I was definitely going over the limit, I don’t think it was any more than 80, as I had my children the car with me and I am not an excessive speeder. I am from out of state and submitted the “not guilty” option, but am not sure I will be able to get to a court 3 hours away, and if my chances of getting the fine reduced are even worth the time. If you get an attorney to represent you, do you still have to attend the proceedings? If no, how much is this attorney service and how much can they generally reduce your ticket? Elisa – Whether you will need to appear depends on which court has jurisdiction over your case. There are two court systems in NY, each with different procedural rules. Both courts, however, will generally allow an attorney to appear on your behalf without your physical presence. I just got a ticket for going 60mph in a 45mph zone in, Eden NY. I currently do not have any points on my license. What fees am I facing and can I take a driving course to knock points off if I get any from this ticket? You are currently facing a 4 point ticket that cost $393 in fines. While defensive driving courses mitigate the impacts of points & violations on your record, they do not entirely avoid them. For this reason, we generally suggest contesting this violation. I got a speed ticket last night while I was on the travel to Niagara falls from MA (Erie county). It was my first time to visit there so I did not know anything about that. And, I am sure that I did not drive at 90 but the cop said I did, so I said I did not to him. But, he finally fined me the ticket for 90, ridiculous. I was with my friend he also argued that I did not drive at 90. The ticket says the speed limit is 65. Of course, I admitted that I might’ve overspeeded. But, how can he know that I was driving at 85? While I am preparing for a laywer consultant, I notice that there are 11~20 and 21~30 mph/hr overspeed tickets. It is totally unfair. I cannot speak English well but he did not seem to listen to me carefully, instead, he just made an assertion and just back. Generally speaking, officers are able to gauge rates of speed based on radar guns, or via personal observation. Any ‘explanation’ you may provide to the officer would rarely assist your situation. So I got pulled over for going 76 in a 55 in upstate ny when the cop issued me a ticket it was for number plate VIO which I was gladly willing to accept. When i showed up to court on my scheduled day and time the court house was locked and nobody else showed up to court and when I say nobody showed up I mean nobody showed up not even the judge. I tried calling the court house and failed to get in contact with anybody and I could not leave a voicemail due to the voicemail inbox being full. So I called the police station that issued the ticket and was told to try calling the court house in the morning. As he suggested I called in the am and I finally got in contact with the court and was told that the court doesn’t offer a night court (which I believe is false information because I have gone to night court at the very same court house) the woman behind the phone told me she was going to send me something in the mail for me to sign and return with my guilty/non guilty plea, but when the item arrived in the mail it INCORRECTLY said “recently you were issued traffic ticket(s) for the above violation and failed to appear. The matter has been resceduled to the date and time listed above. Failure to appear will result in a license/registration suspension by the department of motor vehicles. THIS IS YOUR FINAL NOTICE” also the new date and time on the most recent paperwork from the court that was mailed to me says 6:00pm just like on the original ticket but they told me they don’t offer night court. Now like I said normally I would accept this ticket and be on my day but in this instance. I’m quite fed up with this court and how it is being run and the disrespect that I have received stating that I was the one who failed to appear to court. So I’m looking for some information on how I should go about dealing with my situation that would be greatly appreciated. Zack – due to the nature of the events as you have described them, I would suggest contacting us so we may provide you with guidance regarding the handling of your traffic violation. I just received a ticket for doing 70 in a 55 work zone . Have a mass license and plates, I had the cruise set at 62 and slowed to 60 when entering the work zone , I have three witnesses that were in the truck with me that can attest to that. Caught be a state police radar gun at 125-150ft. (Stalker dual radar) I may be willing to come back out for the day to fight this . What is the penalty? And is there any chance I can beat this? Rick – even assuming the court believes your witnesses, you are effectively admitting to the offense charged. A 4 point speeding ticket in a work zone will include $600 fines, $93 court fees, and a substantial increase to your insurance rates. The procedures for contesting such a ticket will depend on where the incident occurred. I was stopped aggressively and unsafely for going 81 in a 65 mph zone on Interstate I87 going northbound in the town of queensbury (5757). This is my first speeding ticket. The officer cited the charge was based on direct observation and speed was verified by laser model LTI-Ultralyte. Additional information given was 81 mph at 1552 feet. However, the officer was several cars in front of me in the passing lane when I initially saw him. When I moved into the far right lane to exit the interstate, I noticed him in the middle lane right beside me with his lights on, as traffic had slowed down to accommodate him with his lights on. There was a vehicle in front of him and behind him and in front of me and behind me. I slowed down thinking he was trying to get in front of me to exit the interstate responding to a call. However, he just sped up and turned into my lane and put on his brakes almost causing me to hit him before he pulled onto the shoulder. I realized he was trying to pull me over. He asked me why I was driving slow in fast moving traffic. I told him that I thought he was responding to a call and wanted to know why he drove in front of me and brake jobbed me like that as it was extremely unsafe. He told me he wasn’t going to argue with me and wouldn’t tell me initially why he pulled me over. Kelly – please advise whether this was the only ticket you had received at this stop. I got a ticket in Canaan, NY (Columbia County) on Wednesday night around 10pm. 55 in a 35 on state route 295. The speed limit on the majority of the route is 55 but switches to 35 for maybe a half mile stretch going through town which is apparently where I was spotted by the officer. I have a Connecticut license with no previous or pending moving violations in any state. What is the total cost of what I will have to pay if I plead guilty? Also, what is the likelyhood that if I plead not guilty, I can get it reduced or dropped? I’d like to plead not guilty but I don’t want to drive 100 miles for court and take a day off of work, only to be forced to pay the entire amount anyway. Ethan – you are facing a 4 point ticket that carries fines of $393. You must submit a ‘plea’ to the court by the ‘return by’ date. An attorney would be able to secure a reduction of the charges against you – allowing you to avoid not only the points and fines, but insurance implications as well. I got pulled over twice in one day- absurd. The first one I was going 75 in a 65 in Pennslyvania county susquehanna on i-81 going north. I pleaded guilty to that one and payed the fine. Will my insurance go up and will i get points on my new york state drivers license? Also the second ticket, i was marked at 86 in a 65 travelling on i-81 going north but this one was in NY. I pleaded not guity for that one and plan on going to court. What can i do to try to get the points knocked down to nothing? Hi, I was pulled over going 44 in a 30 in the town of Warsaw and received a ticket. I am a first time offender and was wondering if you had any advice on whether I should plead guilty or not. I’ve never received a ticket before, as I stated prior, and am looking for some guidance on how to handle the situation. The ticket only posted the court address and there’s no amount for the fine listed. Any advice you have would be greatly appreciated! Nancy – you are facing a 4 point ticket that carries fines of $300, along with $93 court fees. This if convicted of this violation, your insurance premiums will generally increase. I therefore suggest contesting this violation. I was recently involved in an accident on I-87 in upstate NY (Elizabethtown/Essex Cty) traveling back home to CT. Road conditions were not good (start of a snowstorm) and the road did not look treated (a Sunday morning) Conditions changed rapidly from sleet to snow to rain back to sleet in a matter of a couple of miles. I was going 45-50 in left lane as I passed a car that I felt was impeding my vision due to spray. I hit an ice patch and went into a skid, bounced of left guard rail, spun 180, car that I had passed hit my car then I came to rest against opposite rail facing opposite direction. I was told later on by the tow truck driver that there were 5-6 more accidents up the same stretch around the same time. My car was totaled with minimal damage to other car. No injuries. I could not leave my car as doors would not open. State police came as my husband and I sat in car and asked if I wanted an ambulance, I said no but I was clearly shaken up….she then proceeded to apologize saying”she had to give me a ticket for driving too fast for conditions” ….she had NO idea how fast I was going. On ticket it said I stated the charge was based on officers “information and belief”. I do not believe I am guilty of this charge and unfortunately, due to an unforeseen, stressful family emergency, the ticket said I must respond by 3/22 which I just noticed as I found the misplaced ticket. After careful examination of the ticket, there was no address to send it in to and I am extremely upset as we are in no financial position to incur fines/insurance penalties due to this family emergency and other impending financial responsibilities which take precedence. I have an excellent record, as a driver for over 40 years. I am also a public school teacher who really cannot afford to miss school due to this. If you can in any way assist me or give me guidance, I would sincerely appreciate it! It appears that you were given a ticket for ‘speed not reasonable and prudent.’ This 3 point ticket is frequently issued after an officer appears on the scene of an accident after-the-fact. They are, in essence, assuming you were driving unreasonably based solely on the occurrence of the accident. I suggest pleading not-guilty and contesting this violation. As there was an accident involved, contesting this violation may unfortunately require your personal appearance. Tina – if convicted your license will be suspended due to the high rate of speed. Please advise us of the location of this incident, as that will determine what procedures must be followed in order to contest this ticket. I was ticketed for speeding 71 in a 55 mph zone. The code VTL 1180 OB. I pleaded not guilty and they set for trial. What should I do? Tammy – in order to provide further information, we need to know where this violation occurred. NY has two court systems that have markedly different procedures. We would be happy to discuss with you further. You may reach us at 888-883-5529 for a free consultation. I got a speeding ticket for driving 71 in 50 zone in Queens. This is the first ticket ever. Should I even try to plead not guilty? I read that 21 miles over the speed limit will result in 6 points on my driver record, is pleading not guilty going to change anything? Also in the same sentence on the tickets reads “if your guilty plea results in your having 6 or more points on your driver record for violations commitetd during an 18 month period, a Driver Responsibility Assessment will be imposed”. If I get 6 points in one go, does that still apply to me? Pleading not guilty will allow you to contest your case at trial. This violation will result in 6 points, fines of approximately $203, insurance implications, and an assessment fee, I strongly suggest you contest this ticket. To clarify – if you are found guilty of this offense, you will need to pay the assessment fee. I was pulled over by an officer around 3:00 AM going to pick up a passenger(Lyft Driver) he said I was going 47 mph in a zone of 30 mph! There was a downhill and my vehicle got more speed while going downhill where the officer was also hidden and I did not say anything to the officer because this was actually the first time getting a speed ticket! The location I was pulled over is Mamaroneck, NY. So I pleaded not guilty, and today at 9:30 AM is my first Appearance/Pre-Trial Conference, and I really need any of your help or suggestions of what would be appropriate to say to the judge! Any little help would be much appreciated! Alfons – I suggest contacting us for a free consultation so we may discuss your options. You may reach us at 888-883-5529. On the FDR last night, driver in front of me was driving erratically and I had an opportunity to get by him legally but my speed was excessive, after I completed the pass I was in a zone that drops the speed limit down to 30mph on the FDR (just after the Bklyn Bridge) and was pulled over and cited for 62 in a 30. Not sure what my chances are but from what I’ve read on line it doesn’t look good. 41 yr old married driver with a pretty clean record. Tony – your ticket will be heard by the traffic violations bureau – a unique court system in NY that does not allow for plea bargaining. Rather, in order to contest any ticket, a trial must be conducted. As speeding is a strict liability offense – your driving record, or the reasons for speeding are both not relevant here. In order to obtain a dismissal here, it must be shown that the officer was not able to meet their burden of proof. This is done through cross examining the officer’s testimony. Mahesh – unfortunately, as speeding is a strict liability offense, the reasons for speeding are not relevant. However, you may none-the-less contest this ticket to assure this 4 point violation and the associated penalties are mitigated / avoided. I was radared at 74 mph in a 55mph near Sangerfield, NY. I was in a rental vehicle and did not realize how fast the vehicle was going. This is my first ticket and I am 21 years old. Was on my NYS permit for 5 years, taken the defensive driving course twice and had my NYS license for under a year. Do you think I could win this case via mail since I have no way of attending the court? The officer charged me with law 1180B on Hwy No 20. 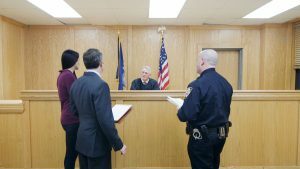 Matthew – In order to contest this ticket, you must plead not guilty – which will then allow you to plea bargain with the prosecutor or set this matter for trial. Hiring an attorney will generally allow you to contest a ticket without personally appearing in court. If you would like to discuss further, you may reach us at 888-883-5529 for a free consultation. While I suggest pleading not guilty and contesting this ticket, the procedures for doing so will vary based on where your husband was issued the violation. If you would like to discuss further, you may contact us for a free consultation at 888-883-5529. I was given a ticket for going 85 in a 65 zone 2 years ago. I plead guilty and paid the fine, however it was counted on my record as a major violation, the same as reckless driving. I did not know this until I failed a background check for a driving job because of it. Is there any way to fight this now 2 years later? Jacob – it may be possible to file a motion to withdraw the underlying guilty plea. What court had jurisdiction over your case is an important factor to consider when filing such a motion. I was ticketed for going 83 in a 55 mph zone. It is my first offense and I am 17 years of age. After pleading not guilty, what should I do/say in court? Jacob – as we know very little facts of your case, and have no way of predicting what an officer will claim, it is impossible to advise you as to what you should state in court. Please be advised, however, that there are two court systems in New York – both of which have markedly different procedural rules for handling traffic violations. My problem is I received a speeding ticket in 2010 driving a Bus on Route 684 ny. I went to trial. Lost my case. Paid all fines plus assessments. But now 2018 get a better job offer but can’t get the job Because the conviction is still on my abstract.. Is there any way to expunge this conviction off my record. Its been 8 years?? Unfortunately, it is not possible to remove a traffic infraction from your record in NY. Hello I am on out of state cdl driver that was driving on i90 thru new york last night 1/13 in my personal vehicle was pulled over and given a speeding ticket for doing 84 in a 65. I need some advice on what to do because this will affect my job. If you would like to discuss further, you may reach us for a free consultation at 888-883-5529. I received a speeding ticket the officer was traveling towards me and she said I was going 55 in a 35 mile an hour Zone. She asked for my driver’s license which is an Arizona driver’s license and my registration and insurance information which clearly shows that I am a New York resident with an Arizona license. She asked if I knew why she stopped me I said no. She told me that I was speeding and did I know how fast I was going. I said if I was speeding then I’d like to see your radar and what speed that you clocked me at. She said she could not show it to me at this time. I asked if she really used her radar or if she just visually assess how fast I was moving while she was traveling towards me. She said her radar clocked me at 55 miles an hour in a 35 mile an hour Zone. I asked her when was the last time she calibrated her radar. She said it didn’t matter because she couldn’t show it to me anyways. She issued me a ticket to appear in the Camillus Courthouse court a 1180 d . She was very unhappy that I questioned her and she let me know that she was going to show up and testify and use the evidence of a statement that I made. When reading the ticket the statement makes no sense she identifies the date the time the location and says icarol a public servant nothing nothing nothing in which you substantially stated as follows 40 in quotation marks. Can you tell me what this means. I made several statements regarding the radar and that I would like to see it other than that I’m not sure what 40 means. I do intend to fight this I’ve never had a traffic ticket in my entire life and I am 51 years old. I do know how fast I was going and it was not 40 if that’s what she suggesting. Will she be able to provide the radar speed when she testifies? I’m sure it matters that she cannot do so. Any help you can offer would be fantastic I am disabled with little income and this would significantly impact my life if this officer is allowed to give me a ticket based on her visual guess while she was moving towards me. While I suggest contesting this ticket, please note that there is no requirement that an officer show you the radar information. Furthermore, officers are trained to provide ‘visual estimates’ of speeds.. Without looking at the ticket, I can not say what information she was attempting to convey on the ticket. I received my first speeding ticket in NYC. I am from out of state (NC). Officer stated I was going 40 in a 25. The way the street was made it was a decline slope that turned into a uphill. Didn’t feel as though I was going that fast. Need some insight involving the point system and my insurance since I am out of state. Shinee – I suggest that you contest this 6 point ticket as it carries significant fines $393, assessment fees of $300, and significant insurance implications. Hi I received a 1180B ticket for going 72 in a 55 as I was attempting to pass a large truck to avoid being to close to his vehicle in town of Tonawanda on interstate I-290. Its a first offense and surrounding vehicles were driving at similar speeds. What would be my best options? Matthew. You are currently facing a 4 point speeding ticket that carries fines of $300, court fees of $93, and substantial increases to your insurance rates. Speeding, being a strict liability offense, does not have any legal defenses. Therefore, while we understand the reason for your speeding, it would not be helpful in your situation. Furthermore, the fact that other drivers were also speeding does not aid in your case for similar reasons. I suggest pleading not guilty and contesting this violation in order to avoid / mitigate the negative consequences. If you would like to discuss further strategy, we would be happy to provide you with a free consultation. You may reach us at 888-883-5529. What about if you’re a NY driver who received a ticket in Montreal? I received the ticket while exiting from route 15 north, onto route 20 west while taking my elderly cousin to the airport. He resides in NY, and France, and I transport him to and from the airport with his wife on december 14th of 2016. When I got up to the exit ramp, a car from Canada flew up behind me, and cut over to my right onto the exit, blocking me from getting over. I chose to slow down until they went by, while I was signaling my lane change. They finally pulled up enough for me to merge over. upon merging, we noticed a woman in dark clothing (there was also a fairly heavy snow squall in this exact spot), who was walking towards traffic from the right shoulder waving to either the car in front of me, or us. I slowed down to see who or what they were, and noticed she was a police officer. She then ran to her car, and came out with siren and lights, I then looked for a safe place to pull over and stopped. she came to the vehicle and spoke french to me, to which I replied that I do not understand french, and she told me to give her my license and registration. I asked her why she had pulled me over and she said that I crossed a solid line back at the exit ramp. I went to speak and before I could, she went to her car. She returned with a ticket in her hand, and once again, I tried to speak and told her that I couldn’t get over as that other car had flown up behind me and was blocking me from getting onto the ramp. That I merged over as safely and swiftly as I could. Her response was “Too Bad For You, Goodbye!”, and left!! When I got home, i called the court and spoke to a clerk explaining to her what happened. She told me to write it up in a letter, and mail it in and they would review it and get back to me. She also asked if I wished to file a complaint against the officer as she was extremely rude to me, and I declined. I figure we all have bad days! Two weeks ago, just before thanksgiving, I received a letter from court in Montreal, to appear for my trial date, ALMOST A YEAR LATER! I’m now not sure how to handle this. The fine on the ticket is $311.00 Canadian, and 3 points which from what i’m told, will count on my commercial license! I don’t feel there should have even been a ticket, and the extra expense will cause me some grief. How do I handle this? We do not handle tickets in Montreal. Hi, I am an exchange student from Singapore who currently resides in Canada. I was on my way back to Montreal from New York where i was caught speeding along the highway. I lost my ticket upon arriving at Montreal and I have no idea what should I do. Date of offence was 22 November 2017. I am returning to Singapore from Montreal in December. Will this affect my return? Kar – where did you receive this ticket? Lori – the court location will be listed on the ticket. I have a question. Is the mandatory NYS surcharge in addition to the fine? Or is it incorporated into the fine? Each ticket carries a mandatory NYS Surcharge of $88 for a city court and $93 for a town or village court. These fines are for first offenses. The mandatory surcharge is in addition to the fine. I was ticketed for going 48 mph in a 35 mph zone. Im a full time student in Buffalo and wanted to know how this ticket can be contested. I was told by an officer a while back that going around 10 over the speed limit was okay when traffic isn’t present. When I was driving the spedometer showed 45 mph for me. Any advice would be helpful, Thanks! Andrew – while officers are less likely to ticket drivers at these lower rates of speed, even travelling 1 mph over the limit may lead to a speeding ticket. Out of state driver registered going 88 in a 65. Ticket was from Town of Courtlandville. Any advice? Should I fight it? William – I suggest that you contest this 6 point ticket as there are expensive fines, and likely impacts to your insurance rates. To provide further information, I would need to know what state you are licensed in. A friend of mine was pulled over near Rochester, NY for going 103 in a 65. He also was driving without a license. He has a valid license in Minnesota, but it was recently misplaced. We are working on receiving a replacement for this. Do you know how this should best be handled? He hopefully will have his replacement license by his court date. Kristen – The first step your friend must take is to plead not guilty to this ticket. I suggest reviewing what they are specificaly charged with, as the charges may range from speeding to a more serious offense. You may reach us for a free consultation at 888-434-0406 to discuss further..